The latest prog out digitally reviewed! In Judge Dredd: Blood of Emeralds we get a bar room brawl, Dredd offered drinks and the investigation gets closer to the conclusion. 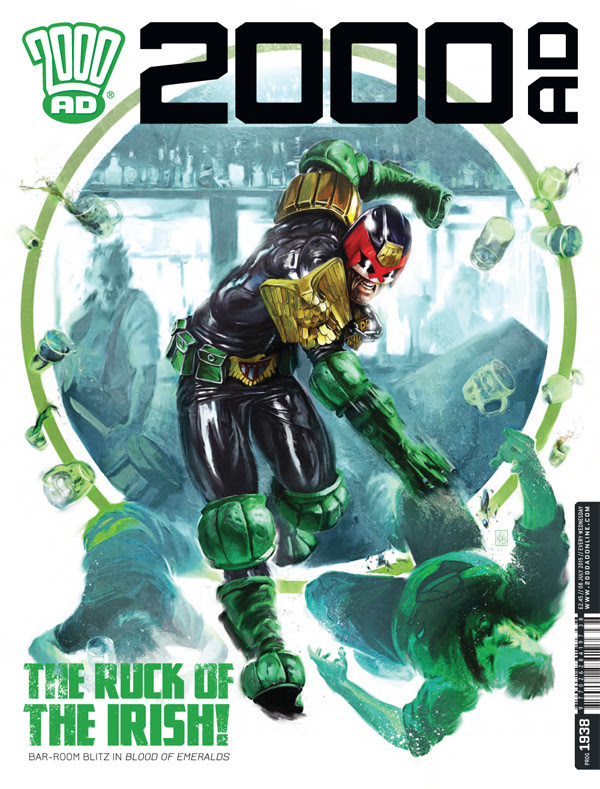 Dredd and Joyce are continuing to get under the skin of the Emerald Isle Judges and they seem to be getting some clues – leaving death and destruction in their wake. It’s all cloak and dagger, so we’re waiting for the reveal in this adventure which puts Dredd in a new location! Parkhouse; Absalom: Under A False Flag has Absolom continuing his investigation as the church and others also seek to clear up their messes and get rid of any unwanted distractions! The split between the Church and the police is excellently done here – especially the last panel – a bad time to be riding a bike! Outlier: Dark Symmetries has the hurde tech causing trouble and those on board the ship don’t know who to trust – neither do we! The art is excellent and the creeping ‘dust’ is excellent! Jaegir: Tartarus has the Nort investigation with Jaegir working the bar and the regular troops – we also get a glimpse into her history as well as the mindset of the troops she is investigating – it’s all very interesting, and grim! Finally Helium has the history of those under the gas cloud and the reason why they are invading above the cloud. Marvel Digital Unlimited First Month For A Penny!